Featuring used Apple Macintosh computers and new and used Macs, parts and accessories. Clicking any link takes you right into the store. We have been online 32 years and on the web since 1994! This page only features a few examples of the items and prices you will find. Visit the Secure Online Store! Buy used Macs here. Here at preowned mac .com you can buy used Macs. Apple Macintosh computer supplies and Mac accessories here. 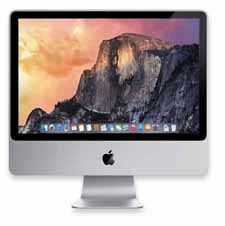 Used, tested, clean Apple PowerMac systems and hardware at value prices. Custom configured and upgraded Mac computers. Buy online! Upgrade your old Mac computer, iMac, MacBook, PowerBook or iBook with parts and assistance from us! We have the stuff you need in stock and supply any needed drivers or instructions, or call our tech support line and let our staff walk you through installation or send your unit in and let us do it for you! Let us help you extend the life of your older Mac.Lower prices on quality MacBook, MacBook Pro, PowerBook and iBook batteries! Get your replacement Mac power supplies here. We have Mac OS upgrade software in stock. CALL. Feel like you are being held up at gunpoint when shopping for cables? Try our premium quality cables at great prices! We have added many new items! If you don't see what you want call our Toll Free 1-877-639-1543 between 9am-6pm CST. We can custom configure your system and install the products we sell at no extra charge when purchasing a system. Remember our bottom line prices include shipping. That better deal you found elsewhere may not be when you get the freight bill. We also man the phones ourselves during business hours in case you need help. Web Cam equipped! Great for School or Home, LOWER PRICE BARGAIN and Backed by an Intel Core Duo 1.83 GHz dual-core processor and 1.0 GB DDR2 RAM, comes with a choice of web browsers including the still supported Roccat web browser allowing you access to modern web sites. It also comes with the latest version of Flash enabling you to enjoy multimedia web sites. The 160 GB SATA hard drive provides plenty of storage for your data and multimedia files. Use the slot-loading SuperDrive to record and store data on CD media, install DVD software, and even watch your favorite DVD movies. Its slim form factor case feature a 17-inch widescreen TFT active matrix display with a 1440 x 900 resolution! Connect to the Internet via integrated 10/100/1000BASE-T Gigabit Ethernet LAN or enjoy wireless connectivity with 802.11g AirPort Extreme. Chat with friends and family over the Internet using the iSight camera! Includes a keyboard and mouse. Nicely refurbished and configured with OSX 10.6.8 Snow Leopard preinstalled (latest version capable). Our SuperSink DVD chock full of Freeware and Shareware is included. Was $249.77 SPECIAL $199.77 price includes domestic shipping. Upgrade to 2GB RAM for $30. See the INTEL or iMac categories in the store. Low End Laptops Now Reduced! Lion Capable Apple MacBook Core 2 Duo $149.77 shipped! Lion capable and Web Cam equipped and backed by an Intel Core 2 Duo T7200 2.0 GHz processor and 1 GB of DDR2 RAM (expandable) 80 GB Hard Drive. Fully updated OSX 10.6.8 Snow Leopard comes pre-installed. Enjoy hours of entertainment with applications like GarageBand, iMovie, or iTunes. Burn and play CDs or watch DVD movies with the CD-RW/DVD combo drive. You'll notice the outstanding, crisp picture quality on the 13.3-inch glossy widescreen TFT LCD display (1280x800) with Intel GMA 950 graphics with 64 MB or DDR2 SDRAM shared with main memory. Integrated HD audio with built-in speakers. Built-in 10/100/1000 Gigabit Ethernet. AirPort Extreme wireless card (WiFi 802.11n) pre-installed. Built-in BLUETOOTH 2.0+ EDR (Enhanced Data Rate) module. Keyboard with touchpad. Built-in iSight WEBCAM and omnidirectional microphone. One Mini-DVI (video out). Two USB2 Ports and a Firewire 400 port with Audio in and out. Magsafe Power Adapter and good used battery (new ones available extra). Thoroughly tested and nicely configured. FREE SuperSink DVD chock full of freeware and shareware. Was $299.77 SPECIAL $149.77 price includes domestic shipping. Upgrade to 2 1 GB RAM for $30, 4 GB $94.77. ASK about NEW Hybrid Hard Drives! WHILE QUANTITES LAST! Also available in BLACK +$20. See the LAPTOP section. Why use reconditioned equipment? Read more. Need help with your hardware? Read Bob's Mac Tech Tips. New lower prices on popular laptop batteries! I am so impressed by the performance of these new Solid State Hybrid FireCuda Hard Drives I have begun replacing them in all of our systems. Is it time to replace your old hard drive? This is the one. Ferocious Performance. Superior Storage. Tireless Durability. We can install these in most units we sell. Call for pricing and availability! FireCudaTM solid state hard drives blend SSD technology with an HDD platform for the instant-on performance and capacity you need. Performs up to 5X faster than a traditional 7200-RPM HD. Lets face it hard drives have a limited life. Adding a new one is the quickest way to insure your data is safe and these new hybrids seriously improve the performance of most all computers. Installs and works like a typical hard drive &endash; no special device drivers or software needed. 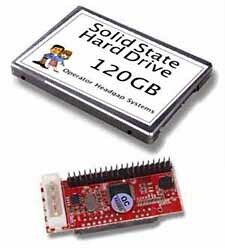 Utilizes solid-state NAND flash and hard drive capacity for unmatched data integrity and reliability. Performance optimized by Seagate Adaptive Memory technology. The cutting edge never felt so safe 5-year factory limited warranty is best-in-class for hard drive warranties. See the IntDrivesSATA section after entering the store. use new SATA mechanisms that come with a complete factory warranty. Thermally cooled via the housing & external power! HIGH SPEED! Brand new 7200 rpm mechanisms and they are in stock now! Our Black Bullet Aluminum Drives feature an all aluminum housing with external power supply to keep the heat out of the housing. We build our external hard drives to be a fast, but affordable high capacity storage solution. They come with Firewire 400, as well as high-speed USB 2.0 ports for the widest possible range of compatibility. We install a new Seagate or Hitachi hard drive mechanism. Includes 2 Firewire 400 ports so you can daisy chain them. Includes the cables, USB 2.0 A-B cable, IEEE 1394 6p-6p cable. REQUIRES Mac OS8.6 or later, OSX compatible (comes Mac HFS Extended formatted for PPC, can be GUID formatted for INTEL on request) El Capitan tested, Windows 98SE/ME/2000/XP/Vista/7, Firewire 400, or USB Port. Our SPECIAL 129.77 includes domestic shipping! We can install new Seagate Hybrid +$20 call. 1 TB Starting at $129.77 See the External Drive section! Our Best Buy in a Later Model Unibody MacBook! This More Powerful Later Model Unibody upgrades up to 16MB of RAM! Optionally we can install your choice of SSD or Hybrid Hard Drives. Runs Snow Leopard up to the LATEST High Sierra! High Sierra Compatible Apple MacBook Core 2 Duo $399.77 shipped! SuperDrive, Airport Extreme-Bluetooth & Webcam! Up to High Sierra (10.13) capable! Later faster model! Really great for School, Office or Home use! Web Cam equipped and backed by an Intel Core 2 Duo P8600 2.4 GHz processor and 2 GB of DDR2 RAM, this MacBook is ready to tackle both heavy workloads and play-related commands. The 250 GB hard drive provides room for an expanding multimedia library. Fully updated OSX 10.6.8 Snow Leopard comes pre-installed (up to High Sierra capable with more RAM, call). The Intel "Core 2 Duo" (P8600) 45 nm "Penryn" processor includes two independent processor "cores" on a single silicon chip. Enjoy hours of entertainment with applications like GarageBand, iMovie, or iTunes. The built in SuperDrive burns and plays CD's and DVD's. You'll notice the outstanding, GeForce 320M "graphics processor 256MB shared with main memory", and a 13.3" widescreen TFT active-matrix "glossy" display (1280x800 native resolution). Integrated HD audio with built-in speakers. Built-in 10/100/1000 Gigabit Ethernet. AirPort Extreme wireless card (WiFi 802.11n) pre-installed. Built-in BLUETOOTH 2.1+ EDR (Enhanced Data Rate) module. Keyboard with touchpad. Built-in iSight WEBCAM and omnidirectional microphone. One Mini-DVI (video out). Two USB2 Ports and Audio in and out. It does not have a Firewire port. Magsafe Power Adapter and good used 6-cell Lithium ion Polymer Battery (new ones available $94.99 and we install these free with your order). Thoroughly tested and nicely configured as all our refurbished systems are. We include our SuperSink DVD chock full of freeware and shareware. WAS $749.77 SALE $399.77! price includes domestic shipping. RAM UPGRADES to 16GB available call. 2GB stick $39.77, 4GB $64.77, 8GB $99.77. Unit comes with 2 1 GB sticks preinstalled. ASK about NEW Hybrid Hard Drives and New Batteries! See the LAPTOP section. EVEN LOWER PRICE - High Sierra Capable! While Quantities Last! ORDER NOW TO AVOID DISAPPOINTMENT! This Model Unibody upgrades up to 8GB of RAM! High Sierra Compatible Apple MacBook Core 2 Duo $299.77 shipped! Up to High Sierra (10.13) capable! Nicely refurbished. Really great for School, Office or Home use! Web Cam equipped and backed by an Intel Core 2 Duo T7550 2.26 GHz processor and 2 GB of DDR2 RAM, 13-Inch (White Polycarbonate "Unibody" - Late 2009) Large 250GB Hard Drive (call for options) Fully updated OSX 10.6.8 Snow Leopard comes pre-installed (up to High Sierra capable, call for options). Enjoy hours of entertainment with applications like GarageBand, iMovie, or iTunes. The built in SuperDrive burns and plays CD's and DVD's. It also features a NVIDIA GeForce 9400M "graphics processor with 256 MB of SDRAM shared with main memory" and a 13.3" widescreen TFT active-matrix LED-backlit "glossy" display (1280x800 native resolution). Integrated HD audio with built-in speakers. Built-in 10/100/1000 Gigabit Ethernet. AirPort Extreme wireless card (WiFi 802.11n) pre-installed. Built-in BLUETOOTH 2.0+ EDR (Enhanced Data Rate) module. Keyboard with touchpad. Built-in iSight WEBCAM and omnidirectional microphone. It has USB 2.0 ports, a single audio in/out port, and a Mini DisplayPort that supports an external display at 2560x1600. It does not have a Firewire port or IR to support a remote. Magsafe Power Adapter included. Good used 6-cell Lithium ion Polymer Battery (new ones available $94.99 and we install these free with your order). Like the aluminum "Unibody" models, this system also has a four-finger "multi-touch" glass trackpad and an integrated battery. Thoroughly tested and nicely configured as all our refurbished systems are. We include our SuperSink DVD chock full of freeware and shareware. Was $349.77 EVEN LOWER $299.77 price includes domestic shipping. RAM UPGRADES to 8GB available call. 2GB stick $45, 4GB $75. Unit comes with 2 1GB sticks preinstalled. Will hold up to 8GB RAM. ASK about NEW Hybrid Hard Drives and New Batteries! LAPTOP section. Best iMac Deal! LOWEST EVER PRICE! These iMacs are upgradeable up to OSX10.11 El Capitan. This make them a good investment since they can run the earlier software as well as more modern. You don't have to give up your AppleWorks or other PPC encoded programs under Snow Leopard. Yet they can run the El Capitan when the need arises. They hold up to 6GB of RAM and are user upgradeable. We can also install Hybrid Seagate 1 or 2 Terabyte Hard Drive for even more performance. They still have a built in SuperDrive allowing you to burn CD's up to Dual Layer DVD's. We even install Sheepshaver allowing you to run most older OS9 software. $100 off! Was $399. A special purchase! Great system for home, school or office! FASTER Penryn Processors! The built-in 20-inch glossy widescreen TFT active-matrix LCD offers an impressive 1680x1050 resolution and has all the Apple software you need with iPhoto, iMovie, iTunes, iPhoto, and GarageBand included! These iMacs is powered by an Intel Core 2 Duo 2.4 GHz processor and 2 GB DDR2 SDRAM so it can handle all your computing tasks with ease! Store your multimedia life on its 250 GB 7200 RPM hard drive and compute in a simple and easy-to-use environment with OSX 10.6.8 pre-installed. Load more software, music, photos, and data with the built-in slot-loading DVD¬±RW DL SuperDrive. Snap pictures and video-chat with friends and family using the built-in iSight camera. Connect to high-speed networks and the Internet with the built-in AirPort Extreme N wireless and built-in 10/100/1000BASE-T Gigabit Ethernet. Add wireless peripherals with Bluetooth 2.1+EDR support. Firewire 800/400, 3 USB 2 ports. OSX10.11 El Capitan capable comes with OSX 10.6.8 Snow Leopard preinstalled (call for options). Aftermarket Keyboard and Mouse included. Our SuperSink DVD chock full of Freeware and Shareware is included. WAS $399.77 a great value but now $299.77 price includes domestic shipping. These units use the faster 6400 RAM upgrades: 2 slots comes with 2 1GB chips, add a 4GB stick for $115 or 2 GB stick for $40 Max. 6GB. We can install the new SUPERFAST Hybrid 1 or 2 TB Hard Drives (call).. See the iMac section. Call for custom configuration! Premium iMac Deal! Home, Office, or School! We found a small supply of upper end iMac units. These units can still run 10.6.8 Snow Leopard but also can run the very latest 10.13 High Sierra. Call for custom configurations. These units have the built in SuperDrives so you can burn your own CD's and DVD's. High Sierra Capable, $100 lower price and a great value! 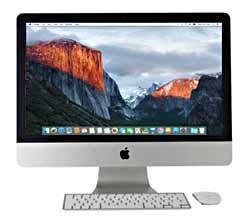 The iMac "Core i3" 3.06 21.5-Inch Aluminum is powered by a dual core 3.06 GHz Intel "Core i3" I3-540 (Clarkdale) processor with a dedicated 256k level 2 cache for each core and a 4 MB shared level 3 cache. In lieu of a system bus, it has a "Direct Media Interface" (DMI) that "connects between the processor and chipset" at 2.5 GT/s. Our refurbished unit is configured with 4 GB of RAM (1333 MHz PC3-10600 DDR3 SDRAM), a 500 GB (7200 RPM) hard drive, a vertically-mounted slot-loading DVD±R DL "SuperDrive", and ATI Radeon HD 4670 graphics with 256 MB of dedicated GDDR3 memory. It also has a built-in iSight video camera and built-in stereo speakers underneath the 21.5" glossy 16:9 LED-backlit TFT Active Matrix LCD (1920x1080 native) display "with IPS technology". Connectivity includes four USB 2.0 ports, a Firewire "800" port, built-in AirPort Extreme (Wireless N), and Gigabit Ethernet, as well as an audio capable Mini DisplayPort, which supports an external display up to 30" (2560x1600). Built-in Bluetooth 2.1+EDR. Built-in Microphone. Externally, this iMac uses "edge-to-edge" glass design and "seamless all aluminum enclosure". This iMac includes a new iKey Keyboard and Logitech Mouse" OSX 10.13 High Sierra capable comes with OSX 10.6.8 Snow Leopard preinstalled (call for options). Our SuperSink DVD chock full of Freeware and Shareware is included. VALUE $949 WAS $799 NOW $699.77 price includes domestic shipping. See the INTEL section. Great for home, office or school! So many of you have asked for a later model MacBook Pro that can run the latest OSX version High Sierra. It also takes up to 8 GB of RAM! Cheryn said if she bought one of these she would want the SUPERBOSS OPTION. This addition to our line starts with 4 GB of RAM (8 Max) and one of the NEW Seagate FireCuda 500 GB Solid State Hybrid Drives and YOU HAVE THE OPTION to upgrade to even larger 1 or 2 TB sizes. Call for RAM upgrade or larger drive option! Nicely refurbished and upgraded unit! 15" MacBook Pro Core i7 2.66GHz $899.77 shipped! SPECIAL "SUPERBOSS" Version MacBook Pro! ! This nicely refurbished unit comes with 4 GB RAM to (or more optionally) and install a NEW 500 GIGABYTE FireCuda Solid State Hybrid Drive (5 yr. factory warranty). Up to High Sierra (10.13) capable (optional). The MacBook Pro "Core i7" 2.66 15-Inch (Mid-2010) is powered by a 32 nm, dual-core 2.66 GHz Intel "Core i7" I7-620M (Arrandale) processor, with dedicated 256k level 2 cache for each core and a 4 MB shared level 3 cache. This system also supports "Turbo Boost" -- which "automatically boosts the processor speed based on workload" up to 3.33 GHz for this model -- and "Hyper Threading" -- which allows the system to recognize four "virtual cores" or "threads." It comes configured with 4 GB of 1066 MHz DDR3 SDRAM (PC3-8500) installed in pairs (two 2 GB modules, but upgradeable to 8 GB), and an 8X DL "SuperDrive", and dual graphics processors -- a NVIDIA GeForce GT 330M with 512 MB of dedicated GDDR3 memory and Intel HD Graphics with 256 MB of RAM shared with the system that Mac OS X automatically switches between for better graphics performance and better battery life, respectively, depending on application use. This model uses a "Unibody" aluminum case design -- milled from a single piece of aluminum and has a backlit keyboard, a new "no button" glass "inertial" multi-touch trackpad, and a non-swappable battery design that provides up to 8-9 hours of battery life (Good Used). We configure these for Snow Leopard 10.6.8 but call for options. FREE SuperSink DVD chock full of freeware and shareware. SPECIAL SUPERBOSS version $899.77 price includes domestic shipping. OPTIONS: 4GB RAM CHIP $49.77 (room for 2 in place of stock). 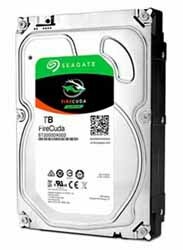 500 GB FireCuda Hard Drive upgrade to 1 TB +$25 or 2 TB $65. Call for options. See the LAPTOP section. These housing are in short supply and will likely not be made much longer. Order now! HIGH SPEED! Brand new Seagate 7200 rpm mechanisms and they are in stock now! Our Black Bullet Aluminum Drives feature an all aluminum housing with external power supply to keep the heat out of the housing. We build our external hard drives to be a fast, but affordable high capacity storage solution. They come with Firewire 400, as well as high-speed USB 2.0 ports for the widest possible range of compatibility. We install a new Seagate hard drive mechanism. Includes 2 Firewire 400 ports so you can daisy chain them. Includes the cables, USB 2.0 A-B cable, IEEE 1394 6p-6p cable. REQUIRES Mac OS8.6 or later, OSX compatible (comes Mac HFS Extended formatted for PPC, can be GUID formatted for INTEL on request) High Sierra tested, Windows 98SE/ME/2000/XP/Vista/7, Firewire 400, or USB Port. Our SPECIAL 129.77 includes domestic shipping! We can install new Seagate Hybrid +$15 call. 1 Terabyte $129.77 See the External Drive section! MacBook Pro Core 2 Duo $679.77 shipped! SPECIAL BOSS VERSION! We upgrade the RAM to 4 GB and install a NEW FireCuda 500 GIGABYTE Hard Drive. El Capitan (10.11) capable (optional). Web Cam equipped and backed by an Intel 2.4 GHz processor and upgraded to 4 GB of DDR2 RAM (2-2GB Chips) NEW 500 GB Hard Drive. Fully updated OSX 10.6.8 Snow Leopard comes pre-installed (software available extra, call for other options). Enjoy hours of entertainment with applications like GarageBand, iMovie, or iTunes. Burn and play CDs or DVD with the Slot-loading SuperDrive DVD¬±RW. You'll notice the outstanding, crisp picture quality The 15.4-inch LCD display offers widescreen viewing that is ideal for work and multimedia applications (1440 x 900 resolution). NVIDIA GeForce 8600M GT w/256 MB of GDDR3 SDRAM. Integrated HD audio with built-in speakers. Built-in 10/100/1000 Gigabit Ethernet. AirPort Extreme wireless card (WiFi 802.11n) pre-installed. Use the built-in Bluetooth 2.1 + EDR wireless technology to connect to your smartphone or other Bluetooth compatible devices. Keyboard with touchpad. Built-in iSight WEBCAM and omnidirectional microphone. One DVI-I (video out). USB 2.0, FireWire 800, FireWire 400 and audio ports including an ExpressCard/34 slot for easy connection to external devices! One (1) ExpressCard/34 slot. Magsafe Power Adapter and good used 6-cell battery (new ones available extra). Thoroughly tested and nicely configured. FREE SuperSink DVD chock full of freeware and shareware. SPECIAL BOSS version $679.77 price includes domestic shipping. See the LAPTOP section. Capable MacBook Pro Core 2 Duo $549.77 shipped! SPECIAL PURCHASE! Back to school, office or home. Really Nice Refurb Units at our BEST PRICE EVER! El Capitan capable but suggest RAM upgrade. Web Cam equipped and backed by an Intel 2.4GHz processor and 2 GB of DDR2 RAM (expandable 6GB) 200 GB Hard Drive. Fully updated OSX 10.6.8 Snow Leopard comes pre-installed (software available extra, call for other options). Enjoy hours of entertainment with applications like GarageBand, iMovie, or iTunes. Burn and play CDs or DVD with the Slot-loading SuperDrive DVD¬±RW. You'll notice the outstanding, crisp picture quality The 15.4-inch LCD display offers widescreen viewing that is ideal for work and multimedia applications (1440 x 900 resolution). NVIDIA GeForce 8600M GT w/256 MB of GDDR3 SDRAM. Integrated HD audio with built-in speakers. Built-in 10/100/1000 Gigabit Ethernet. AirPort Extreme wireless card (WiFi 802.11n) pre-installed. Use the built-in Bluetooth 2.1 + EDR wireless technology to connect to your smartphone or other Bluetooth compatible devices. Keyboard with touchpad. Built-in iSight WEBCAM and omnidirectional microphone. One DVI-I (video out). USB 2.0, FireWire 800, FireWire 400 and audio ports including an ExpressCard/34 slot for easy connection to external devices! One (1) ExpressCard/34 slot. Magsafe Power Adapter and good used 6-cell battery (new ones available extra). Thoroughly tested and nicely configured. FREE SuperSink DVD chock full of freeware and shareware. We sold dozens at $949, NOW LOWER $549.77 price includes domestic shipping. Upgrade to 3GB $44.77, Upgrade to the Max 6GB $109.77. See the LAPTOP section. Cheryn said why don't we offer our Mac Pro Towers at the same low price but upgrade the hard drives to the NEW Seagate FireCuda HYBRID Hard Drive. The speed of an SSD Digital Drive with the capacity of a normal drive. Order now and we will automatically upgrade your new 1 Terabyte Hard Drive that we install in our systems to a Seagate Hybrid 1 Terabyte Drive! Also see our 2.8 Quad that is El Capitan capable, with the same FREE HYBRID DRIVE UPGRADE! Want a faster unit? Call! Truckload Sale! Lion capable and Web Cam equipped! Great for School or Home, LOWER PRICE BARGAIN and Backed by an Intel Core Duo T2400 1.83 GHz dual-core processor and 1.0 GB DDR2 RAM, comes with a choice of web browsers including the still supported Roccat web browser allowing you access to modern web sites. It also comes with the latest version of Flash enabling you to enjoy multimedia web sites. The 160 GB SATA hard drive provides plenty of storage for your data and multimedia files. Use the slot-loading SuperDrive to record and store data on CD media, install DVD software, and even watch your favorite DVD movies. Its slim form factor case feature a 17-inch widescreen TFT active matrix display with a 1440 x 900 resolution! Connect to the Internet via integrated 10/100/1000BASE-T Gigabit Ethernet LAN or enjoy wireless connectivity with 802.11g AirPort Extreme. Chat with friends and family over the Internet using the iSight camera! Includes a keyboard and mouse. Nicely refurbished and configured with OSX 10.6.8 Snow Leopard preinstalled (latest version capable). Our SuperSink DVD chock full of Freeware and Shareware is included. Was $249.77 SPECIAL $199.77 price includes domestic shipping. Upgrade to 2GB RAM for $30. See the INTEL or iMac categories in the store. Lion Capable Apple MacBook Core 2 Duo $219.77 shipped! Lion capable and Web Cam equipped and backed by an Intel Core 2 Duo T7200 2.0 GHz processor and 1 GB of DDR2 RAM (expandable) 80 GB Hard Drive. Fully updated OSX 10.6.8 Snow Leopard comes pre-installed. Enjoy hours of entertainment with applications like GarageBand, iMovie, or iTunes. Burn and play CDs or watch DVD movies with the CD-RW/DVD combo drive. You'll notice the outstanding, crisp picture quality on the 13.3-inch glossy widescreen TFT LCD display (1280x800) with Intel GMA 950 graphics with 64 MB or DDR2 SDRAM shared with main memory. Integrated HD audio with built-in speakers. Built-in 10/100/1000 Gigabit Ethernet. AirPort Extreme wireless card (WiFi 802.11n) pre-installed. Built-in BLUETOOTH 2.0+ EDR (Enhanced Data Rate) module. Keyboard with touchpad. Built-in iSight WEBCAM and omnidirectional microphone. One Mini-DVI (video out). Two USB2 Ports and a Firewire 400 port with Audio in and out. Magsafe Power Adapter and good used battery (new ones available extra). Thoroughly tested and nicely configured. FREE SuperSink DVD chock full of freeware and shareware. Was $399.77 SPECIAL $299.77 price includes domestic shipping. Upgrade to 2 1 GB RAM for $30, 4 GB $94.77. ASK about NEW Hybrid Hard Drives! WHILE QUANTITES LAST! Also available in BLACK +$20. See the LAPTOP section. Value Priced G4 Mac! Burn DVD's or CD's! RUN OSX or OS9. These Upgraded Sawtooth or Gigabit Ethernet PowerMac G4/450's come nicely configured. We install our refurb Super Drive and include Toast for easy burning. 512MB of RAM Installed. We put in a refurb 40 GB Drive (Fast New Solid State Drives available call). We thoroughly clean and rigorously test each unit. Video Card: 16 MB ATI RAGE 128 Pro AGP. Built in 10/100 Ethernet, NO MODEM - add a built in 56K Modem +$10. It has a spot for the optional Airport card. Install more ram $49.77 for new 512MB SDRAM. These systems come with two each built in Firewire and USB ports. VGA out. Service manual (.pdf) on system. Keyboard and mouse available extra (see the input section). OSX Super Sink DVD chock full of freeware and shareware. Mac OS10.4.11 and 9.2.2 dual bootable. Weight: 30 lbs. Dimensions: 17"Hx8.9"Wx18.4"D. Has HD15 (PC Style) Video out. Our $279.77 includes your domestic shipping. We will install a NEW Digital 120GB Hard Drive in place of the refurb 80 for +$60 Call for upgrades. Sell us your old unit. Call or email for custom configurations. Solid State Drives for Your G4! Cheryn tells me we are having trouble finding 80 or 120GB refurbished hard drives for our older Mac customers. There haven't been new ones available for years. We know you depend on us to help keep your old gear running efficiently. These brand new digital solid state drives have no moving parts making them not only faster but more reliable. We still think you should keep your system backed up but running from these super fast brand new drives only make sense. We haven't carried SSD drives much before but we think now that the prices are more affordable now is the time. We found the right kind of adapter that allows you to configure it for Master, Slave or Cable Select depending on your needs. That makes these more compatible and easily configurable with an included jumper. We can set these up for your system or you can use copy software to move your old data. Let us know how we can help speed up your G4 system. I tested these on our servers so you know they are fast and dependable. INTRODUCTORY PRICE $99.77 INCLUDES SHIPPING! Replace that old CRT. Perfect Companion to your Older Mac! PERFECT FOR OLDER MACS! Headgap approved. Works with earlier Macs (may require adapter). Replace your old and dim CRT and use only 10% of the power. These units have the 4x3 ratio and works well with earlier Macs without stretching out the pixels and are easily adapted even to the earlier Macs. With a 17-inch diagonal TFT Active Matrix LCD display, this super slim monitor makes a great addition to any desktop. Enjoy rich, detailed text and graphics with a 1280 x 1024 resolution. Its 300 cd/m2 brightness and 1000:1 contrast ratio provides excellent color and enhanced brightness, combined with the wide viewing angle makes every seat the best one in the house. Whether you are looking to add a second (or third) monitor, or simply replace an old CRT monitor, this Namebrand 17-inch LCD monitor provides top of the line performance and reliability with out top of the line prices. VGA Connectible (3 row 15 pin) works with G4 and up Macs - adapters for earlier or laptop Macs in stock. Item image is representative only, item may vary. Our $99.77 price includes domestic shipping. Monitor/Video category. Adapters for earlier Macs in the same section. Name Brand - Perfect Companion to your Mac! Headgap approved factory refurb. Increase your productivity with this 22-inch Name Brand Widescreen LCD monitor! The bright 22-inch Widescreen LCD features a 1680x1050 16:10 widescreen resolution that makes working on multiple documents and applications a breeze! A high 1000:1 contrast ratio and 250 cd/m2 brightness brings out the crisp detail in graphics, photos, and videos. Also, its fast 5 ms response time is great for gaming! 90 day direct warranty. Connectors: 15-pin VGA. Dimensions: 20.7 x 17.2 x 8.1-inches (HxWxD, approx.). This unit works fine even on a stock G4 16MB Graphics Card in OS9 or X. Item image is representative only, item may vary. Our $199.77 price includes domestic shipping. Monitor/Video category. Upgrade your G4, G5 or MacPro Tower DVD Drive Today! These are bootable drives. Many of you know that the day would come when no more IDE DVD drives would be available. We fretted over this but did manage to find a good adapter allowing us to use the SATA versions of the drives. We found a FASTER LG SuperDrive and bought a large quantity. They are even faster in the DVD Burning at 24X and CD Burning department at 48X. We are offering a special introductory low price! Burn DVD's and CD's! Tested in OS9.1 up through El Capitan! New model supports DVD burns at up to 24X! Dual layer support. These make great replacements for Macintosh G4 Towers Yikes through Mirror Doors, G5 Towers, G4 iMacs, and even eMacs! At $59.77 you can't go wrong. We include pictured instructions, Toast Lite CD burning software and patches to make it OS9 and X compatible. Close to twice the capacity (Dual Layer Capable)! Apple Bootable allows you to boot from emergency disks and any Apple install disks etc. Only Headgap offers compatibility patches and complete pictured instructions. Toast Lite Burning Software, You must supply your own version of Toast for Lion and above. Our $59.77 includes domestic shipping. See the DVD,CD,CDRW section. SPECIAL! 2 Port USB2 PCI Card for the Mac! Make your older Mac USB 2 compatible! Get an iPod and your older G3 or G4 only has USB 1.1? This adds high speed USB2 under OSX! Leave it to Headgap to bring you USB 2.0 OSX tested card at an BARGAIN PRICE! These are also tested iPod compatible and feature the superior NEC chipset. Add 2 External USB 2.0 compatible ports to your PCI based Power Mac! USB 2.0 standards are only supported in OSX, but these cards work fine in OS8.6-9.2 in USB1.1 mode. These work with your existing USB items plus they support the NEW US 2.0 high speed devices (assuming they are Mac compatible)! Comes with Free Kitchen Sink CD for OS9 drivers, X works straight up, As with ALL USB2 cards sleep mode in 9 keeps machine from going to sleep, but works perfectly for most in X (simply disable sleep mode if not). Our price $19.77 includes shipping. Works in Beige G3 with the later $77D.45F1 ROMS or better systems. Terrific upgrade for your BWG3, & G4 systems. These DO NOT WORK in the older PowerMac 7200-9600 units, use the USB 1.1 cards. See the USB Card section of the store. 5 Port Cards also in stock! Make any Mac with USB Wireless! Provides Faster Wireless N networking on iMacs, Mini's, iBooks, Powerbooks, and MacBooks or any Mac with a USB 2 Port! New Mini SIze! Finally a reasonable cost USB Wireless solution for the Macintosh! Mac OSX 10.4 to 10.6 compatible! Extend your wireless coverage and experience greater speed with this Wireless N USB 2.0 Adapter! Based on the 802.11n 2.0 standard, this Wireless N USB Adapter delivers the highest wireless data rate so you can enjoy uninterrupted data streaming. This Wireless N USB Adapter features integrated antenna and is backwards compatible with 802.11b/g networks! With WPA2, WPA, 802.1x and WEP security encryption, the Wireless N USB Adapter helps keep your wireless connection secure from intruders. Transmit: Up to 150 Mbps, Receive: Up to 300 Mbps. Frequency Band: 2.4 - 2.5 GHz. REQUIRES: USB2 Port, 10.4 to10.8 & a compatible wireless network. Includes our OSX Super Sink DVD ($14.77 value) with drivers from us DOES NOT WORK WITH OS VERSIONS EARLIER THAN 10.4. Our $34.77 price includes domestic shipping. See the Wireless section of the store. We have OSX Tiger 10.4 or Leopard 10.5 DVD's In Stock and our OSX Super Sink DVD chock full of updates, freeware and shareware! See the software section of the store. Call and ask for the CD of the Tiger version if you need one. Sure it is ugly and pink but you are not likely to lose it. Turns out hot pink is not a popular color so we got a bargain price! Four(4) USB ports, and One USB Connector. High Speed USB 2.0 interface, backwards compatible with 1.1. Connect up to 4 devices using 1 USB port on your computer. USB cable is stored inside for easy carry & convenience (2.5" approximate length). Not for high power draw items like self powered hard drives. Our low price $1.99 WITH any order. See the USB Device section of the store. JUST PLUG IT IN TO ADD Bluetooth wireless technology to your Mac! The Dynamode BT-USB-M1 Bluetooth v2.0+EDR Class 1 adapter features a USB 2.0 interface and features a tiny Bluetooth transceiver that isn't much larger than the connector itself! With such a tiny connector, you can leave it plugged in so you don't break it or lose it. It provides you with Bluetooth v2.0 support with Enhanced Data Rate (EDR) of up to 3 Mb/s and provides Class 1 operating range of over 300 feet. Requires and open USB port and OSX 10.4 and above (Headgap Tested). Uses Apple's built in bluetooth support, no drivers to install. Must be plugged into a root port. Our Low Price $12.77 includes domestic shipping. See the Wireless of the store. MORE POWER MEANS FASTER CHARGING. The 85-Watt MagSafe Power Adapter for Apple MacBook, MacBook Pro features a magnetic DC connector that ensures your power cable will disconnect if it experiences undue strain and helps prevent fraying or weakening of the cables over time. In addition, the magnetic DC helps guide the plug into the system for a quick and secure connection. When the connection is secure, an LED located at the Head of the DC connector will light; an amber light lets you know that your portable is charging, while a green light tells you that you have a full charge. An AC cord is provided with the adapter for maximum cord length, while the AC wall adapter (also provided) gives users an even easier and more compact way to travel. This power adapter recharges the lithium polymer Battery while the system is off, on, or in sleep mode. It also powers the system if you choose to operate without a battery. Refurbished like new. See the Power Supply section of the store. Was $69.77 LOWER SALE PRICE $49.77 price includes domestic shipping. Add Gigabit Ethernet Speed to OS8.6 - OSX! Gigabit Ethernet PCI Card for the Mac! Perfect replacement for your lightning or power surge damaged units. Leopard Tested! I tested this card on a G3 Desktop in OS8.6 on our own network. This card reduces latency even on slower 100 base networks. Now with OS 8.6, OS9 and X drivers! Leave it to Headgap to bring you a bargain priced high quality 10/100/1000 base-T Ethernet Card! If you are transferring lots of files across your network you may want to add this card. This card NOW WORKS IN OS8.6, 9 and X and classic mode. Folks moving large multimedia files, video etc. on a 1000 base-T network will benefit from this high performance card. This A-8110S PCI ethernet card adheres to IEEE 802.3, 802.3u, and 802.3ab standards. This Realtek Chipset PCI 10/100/1000Mbps Gigabit Ethernet adapter is a high-bandwidth network adapter that auto-senses 10/100/1000Mbps connection speed, half/full-duplex modes, and supports Wake-On-LAN and remote Wake-UP support. LEDs: Four (4) Green LEDs support for display 1000Link, 100Link, 10Link Activity Status. REQUIRES G3 or G4 RUNNING OS8.6, OS9, OSX 10.2 or later with available PCI Slot Mac drivers included on CD by us. Tiger and Leopard actually work straight up with no need to install drivers! Compare at $79.99 Our $24.77 price includes shipping. NETWORKING section of the store. Price REDUCED! Original Factory Bootable CD only. A must have for your 8.1 to 9.2.2 Power Mac System! Take care of that flashing question mark. Norton Disk Doctor fixes it now and keeps it fixed. Norton SystemWorks for Macintosh® is the smartest way to keep your Mac® at its best. This essential suite features Symantec's best-selling Macintosh software products plus two other top utilities. Norton Utilities 6.0 helps you repair and optimize disks, recover lost data, and prevent future problems. Norton AntiVirus 7.0 finds and repairs infected files to keep your data safe and secure. Dantz Retrospect® Express Backup copies files quickly and easily to a wide range of removable media. Buy Norton SystemWorks today to protect your Macintosh from viruses and keep it running at peak performance! System Requirements: PowerPC-based Macintosh® system, Mac® OS 8.1 through OS9.2.2 (system must be able to boot from OS9.0 (NOT FOR OSX! DO NOT USE WITH OSX), 24 MB of RAM, 20 MB hard disk space for Norton AntiVirus and Norton Utilities, 30 MB hard disk space for Dantz Retrospect® Express, CD-ROM drive, & Internet connection required for LiveUpdate. Opened software is not returnable. INCLUDES CD-ROM ONLY no box. New Lower Price Was $9.99 NOW $7.99 Shipped. SOFTWARE section of the store. Upgrade your old used Mac computer, MacBook, MacBook Pro, PowerBook or iBook with parts and assistance from us! We have the stuff you need in stock and supply any needed drivers or instructions, or call our tech support line and let our staff walk you through installation. We have PowerMac G4 Parts, and PowerMac G5 Parts in stock. Click Here to order G4 Power Supplies! Enter the Power Supply section after entering the store. Click Here to Enter Store! 3.6V Mac Battery! 4.5V Mac Battery!! We know that many of you have come to depend on us for your Macintosh battery needs. Consider us your source for superior Mac batteries. We are distributors for the premium long lasting 3.6V 1/2AA Lithium Mac Battery 1200mAh for the Macintosh! ULTRALIFE's are now in stock and shipping! NOBODY SELLS FRESHER MAC BATTERIES THAN WE DO. Manufacture date stamped right on the battery. We purchase these batteries factory fresh and have them airfreighted in quantity. Our low $7.88 price includes domestic shipping. Call for quantity discounts (10 or more). Select the battery category when you arrive and place your order securely. We also stock factory fresh 4.5V alkaline batteries that work in many Performa's and older Macs. We have iMacG5, Mac Mini, G5 Tower, Mac Pro, Lithium Coin Cells & lower prices on popular iBook, PowerBook, MacBook, MacBook Pro batteries! Great values on used, tested, clean Macintosh Computers! 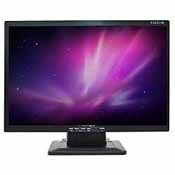 ABOUT MONITORS: We now stock a select few Flat Panel LCD's. These are tested on Macs and we will not sell any of the dark slow and fuzzy junk you sometimes find at bargain basement prices. These are new units (unless noted) and are bright and sharp. We don't carry much in CRT monitors. They are heavy to ship and the larger ones are subject to damage in shipping. We recommend you use our low cost Mac to PC monitor adapter (see our monitor section) ). 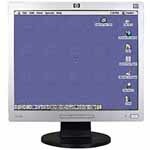 Easily adapt most any PC monitor to your older beige Macintosh including flat panels LCD's. Compare at $24.99 to $44.99 our Special Price $19.99 includes domestic shipping. G3 Blue & White, G4 and above take PC HD15 connections straight up! No adapter needed for those models. We also carry video card upgrades for many models that really improve your systems performance. Our adapters even allow small LCD use with older Mac systems. ABOUT MODEMS: We have internal modems for many different models. We also have a few used serial modems. See the modem section of our online store. Zoom makes a 56K USB Modem Model 3095, that will work with your system. It works with older classic OSes from 9.2 (and probably 8.6 if you manually install the CCL) up to 10.6 although you will have to likely manually install some components. MAC REPAIR & UPGRADES: Want to repair or update your old (out of warranty) Mac and don't know how? Send us your old system and let us install any of the items we sell. Add processor upgrades, optimize your existing processor, more ram, larger drives, or perhaps an internal burner. We also professionally install all Apple Macintosh OS versions including OSX and update it to the latest versions from Apple. We also test, and thoroughly clean inside and out. Give us a call or email us with your particulars. We repair out of warranty laptops at fair prices, laptop expert technicians on staff. We also provide low level hard drive recovery at reasonable rates. Call for details. Need your old data moved to a new drive or system? Let us do that for you. Need your old floppies, Zips, Syquests, etc. moved to CD or DVD - give us a call. ABOUT HEADGAP REFURBISHED COMPUTERS: What makes us different is we not only clean and thoroughly test each system, we many times replace the hard drives, optical drives, memory with upgraded replacements. Operator Headgap Systems purchases good used Mac systems in quantity. Our professional staff of refurbishers clean, perform over 50 diagnostic tests including DOD level drive formatting. All our systems come smartly configured and ready to use. Our refurbished used Mac Computers come with the required cables and cords (except keyboards unless noted, use your old one or available extra). We even include a free mouse pad. We offer a quality refurbished product at the lowest possible price and stand behind our systems with a 90 day warranty. Why use reconditioned equipment? Read more. NICELY CONFIGURED? : When you select any of our systems you get not only the basic system software preinstalled. We update the OS software to the latest version. We also install many open source, freeware and shareware programs and configure them for use on your system. For example LibreOffice is an Open Source Clone of Office for the Mac. It allows you to open and save Word, PowerPoint, Excel file in their formats making it easy to exchange your work with other Office users. We also install Flip4Mac and Perian which extends Quicktime allowing you to playback many types of multimedia files like .divx and .wmv in a larger variety of formats. Firefox and TenFour Fox gives you an additional browser choice over Apple's Safari and much, much more. On older PPC equipped systems including G4 and G5 models we install an update Flash Plugin allowing better YouTube playback. Plus we always include the OSX Kitchen Sink that is chock full of other programs you may find useful and wish to add for use with your new system. TRADE-INS OR SELL YOUR OLD MAC Remember we pay wholesale prices. Many times when you are ready to upgrade your old used Apple computer system may not be worth much, especially to a dealer who is used to buying in quantity at wholesale prices and has the units shipped in bulk truck freight. Boxing and shipping your old system costs a few dollars. Here lately we have been having more trouble locating older systems people are still buying. We will begin offering trade-ins or to buy outright certain older systems. The following are on the list: used PowerMac G4, QuickSilver G4, G3 Desktops, PowerMac 7300, Quadra or Centris 650, 800, 840, and Mac IICI's and SI's. The units need to be cosmetically in good condition and working (at least chiming). Trade in value will vary from the top wholesale price for extra clean, that exceed stock configurations and down for less that prime units. 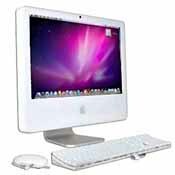 We are also purchasing good used Apple Desktop Bus Mouse II ADB Mice, working StyleWriters, and SCSI & USB Zip Drives. WE BUY USED SONNET G4 AGP PROCESSORS. We are also purchasing good used Apple Desktop Bus Mouse II ADB Mice. Email your list: cheryn or use the online form for quotes. RECYCLING If you have computing Macintosh items and hate to throw them away but figure they have little or no value in todays market, rather than dumping them to a landfill, write us with a list. Email: cheryn or the online form. Any of the items we can use we will pay your shipping. You can rest assured that we will put your old Mac items back into circulation either using them to repair old equipment or including the items with systems. All hard drives are thoroughly DOD level formatted so have no fear about any data left on a hard drive. We properly recycle any items we end up having to discard. We do not accept CRT type monitors or LaserWriters (too heavy and little value). Make sure you include a shipping address and a phone number. Keep in mind that personal checks may take up to two weeks to clear. Money orders are faster for us to process. All payments must be in U.S. funds. SHIPPING INFO: All orders are packed same or next day. We strive to have all items shown in our store in stock. Should any item be out of stock we will contact you either via email or phone to let you determine what you want to do. Depending on your order we normally ship one of three ways. Small orders both in size and dollars are generally mailed. Items of size and or value are shipped either FedEx Ground or UPS Ground depending on the area you live in. When your order is entered you will receive an email receipt, after it is processed and shipped you will receive an additional email notice (assuming you gave us a valid email) with your tracking number on UPS or FedEx orders. All large orders have to be signed for. Shipping is always included in the bottom line price of your order. No additional charges are added (except for sales tax in Oklahoma). Call if you need express shipping. Jaguar, Spotlight, Xcode and QuickTime are trademarks of Apple Computer, Inc.
All other trademarks are properties of their prospective owners. All pages for this web site were built and hosted using our used refurbished Power Mac computers. Still no viruses for OSX systems, why would anyone use a PC?